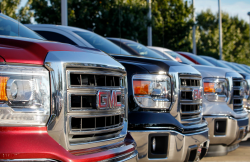 Lawsuit alleges Chevy Silverado and GMC Sierra 2500 and 3500 HD trucks can't handle diesel fuel. January 7, 2019 — A GM class-action lawsuit alleges Chevrolet Silverado 2500 and 3500 HD and GMC Sierra 2500 and 3500 HD diesel trucks are equipped with defective Bosch CP4 fuel pumps that aren't compatible with U.S. diesel fuel. According to the lawsuit, California and Texas owners of the 2011-2016 diesel trucks are at risk of paying thousands of dollars to repair the 6.6-liter V-8 turbocharged Duramax vehicles. The General Motors class-action lawsuit was filed by two plaintiffs who claim the Bosch CP4 fuel pumps were installed in the diesel trucks to save money because the pumps use less fuel by creating higher fuel pressures with less volume. However, the lawsuit alleges U.S. diesel fuel doesn't have enough lubrication to prevent the CP4 pumps from failing. According to the plaintiffs, a failed fuel pump creates tiny metal particles that travel throughout the fuel system and leaves a drivers no choice but to replace the pump, fuel injectors, lines and the fuel rails. However, replacing one allegedly defective fuel pump with the same CP4 pump will cause future trips to a dealer for more repairs and replacements. Plaintiff Jacqueline Bargstedt says she purchased a new 2011 Chevrolet Silverado 3500 in Texas, but the check engine light came on in January 2017 when the truck had about 107,000 on the odometer. Although the lawsuit doesn't specify what went wrong with the truck, the plaintiff says the dealership refused to cover anything under warranty. Bargstedt claims she spent more than $10,000 for repairs, but the lawsuit doesn't say what kind of repairs were made. Plaintiff Calvin Smith says he bought a new 2012 Chevrolet Silverado 2500 in California and in October 2017 the fuel line failed from metal debris from the CP4 fuel pump. Smith claims his GM dealer told him many vehicles were suffering from the same fuel pump problems. In addition, the plaintiff says he had to pay about $4,500 for repairs due to the failed fuel pump. The class-action alleges General Motors has known about the diesel fuel pump problems and how those alleged problems make the trucks far less valuable than they would be without the high-pressure CP4 pumps. The lawsuit also alleges the Chevy and GMC trucks have issues because they don't have lift pumps that could possibly help supply fuel to the pumps. The fuel pumps must allegedly work harder without lift pumps, causing the wear and tear necessary to damage the pumps. Additionally, the plaintiffs claim GM made a mistake by not installing a filter between the pump and injectors to block metal shavings from cruising through the fuel systems. The lawsuit further alleges a diesel truck owner may be forced to pay $10,000 to get the truck roadworthy, unless cracked gears ram through the front timing cover. Damage like that, according to the plaintiffs, will send repair costs even higher. Although the plaintiff's trucks allegedly suffered fuel pump failures when the trucks had more than 100,000 miles on them, the lawsuit alleges the CP4 pumps often fail at less than 50,000 miles. The lawsuit also says some GM trucks have made it less than 10,000 miles before the Bosch pumps failed. The GM class-action lawsuit was filed in the U.S. District Court for the Northern District of California - Calvin Smith and Jacqueline Bargstedt, et al., v. General Motors Company. The plaintiffs are represented by the Gibbs Law Group.